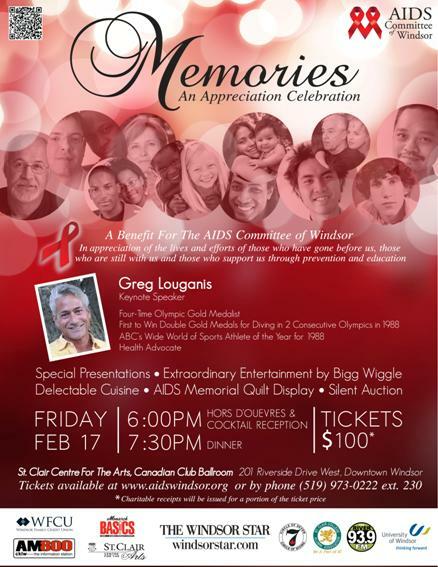 The AIDS Committee of Windsor will welcome Greg Louganis, four-time Olympic Gold Medalist, ABC Wide World of Sports Athlete of the Year in 1988, and health advocate as the keynote speaker for next month’s Memories Appreciation Celebration Gala on February 17th. Greg was first man to win double gold medals for diving in two consecutive Olympics, and in the same year tested positive for HIV. Since then, Louganis has become a renowned public speaker and inspiration to many, advocating for diversity, gender and sexuality, health and wellness, and helping to break the barriers of stigma related to HIV/AIDS. The evening will also feature extraordinary entertainment by BIGG WIGGLE, Delectable Cuisine, Silent Auction, special presentations and the display of the national AIDS Memorial Quilt. The Memories Appreciation Celebration Gala annual fundraising event honours the lives and efforts of those who have gone before us, those who are still with us and those who support our efforts. The signature gala for the AIDS Committee will be held at the St. Clair Centre for the Arts in Downtown Windsor. Tickets are $100.